“The road may be narrow, steep, and slippery, but nevertheless remains straight. As we pursue this agenda of good governance on the straight path led by PNoy, our people will, in due course, ultimately reap the benefits of freedom and democracy. This straight road ahead will over time widen opportunities for all, particularly those who have been marginalized from politics and economics.” This was how Atty. Chito Gascon, Managing Trustee of the National Institute for Policy Studies (NIPS) and Director-General of the Liberal Party of the Philippines (LP) described the role of NIPS and LP in the Aquino administration. 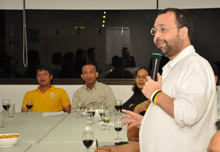 Members of NIPS gathered at the premises of the Friedrich Naumann Foundation for Liberty (FNF) in Makati City on 27 October 2010 to discuss how liberal organizations could support the government of President Benigno “Noynoy” Aquino III. Dr. Neric Acosta, NIPS Chairman and LP Vice President for Mindanao, acknowledged the tension among the different interest groups that contributed in the victory of President Noynoy Aquino. He said that it is LP’s responsibility to be the mediator, and that LP should be at the forefront of change. “I believe that LP is the catalyst to institutionalize reforms in politics with people power as its guide,” Dr. Acosta stressed. Dr. Edna Co, Dean of the University of the Philippines National College for Public Administration and Governance (UP NCPAG), shared that there may be frustrations “because of the ambivalence of the President and his weak decisions, but people should give him space.” “There is a democratic hole that President Aquino has to deal with. He was elected by varied groups whose expectations he cannot fail,” said Dr. Co. She conveyed that she appreciated the political attitude of NIPS and LP. “The analysis of the political environment in this meeting was two-edged: sharp, real and honest, but supportive. I have high hopes that we will achieve reforms, and now I have higher regard for LP,” she expressed. The occasion also welcomed FNF’s Country Director Jules Maaten who stated that the Philippines was a beacon of hope for democracy. “The political participation of Filipinos is remarkable. The fight against martial rule up to ensuring credible and honest elections on May 10, 2010 were phenomenal,” commented Mr. Maaten. The partnership of NIPS and FNF was also discussed. Mr. Gerry Bulatao, NIPS Auditor, solicited FNF’s support to continue bringing liberalism to localities. “Jules as a politician knows that it is important to cultivate relations with local government units. He understands that politics is local,” said Mr. Bulatao.